Someone said to me recently that when your parents die, if they are old, have led a good life, and are ready to go, then you don’t grieve so much. I have recently discovered both the truth and untruth of this, when my Dad died on 25th September, and then my Mum died just a week later. If you’ve followed me for a while, you’ll know my dear Dad had had a stroke the year previously, just 8 days after he had completed his final part of his end of life plan, the Advance Healthcare Directive. Thank goodness we had that document, which the consultant in the hospital was so very grateful for. Dad surprised us all in the end, by regaining his swallowing reflex and started to eat, getting slowly stronger and leaving hospital for home after 4 months. Sadly, he never recovered his speech, nor his continence, and was therefore attended to by carers 4 times a day, visiting the house. During this time my Mum had had problems with her leg and balance and before long it was diagnosed as motor neurone disease, a degenerative muscular disorder that meant it would be a long, slow decline for her. Relentlessly positive, Mum would say she was just glad it was not dementia, which was her big fear. She also was grateful that both her and Dad were going downhill together, referring to themselves as the Crumblies who lived in Crumbly Cottage. Both their lives slowly began to focus in on just the house, garden, and the family. In the meantime, for what has turned out to be the last year, my siblings and I were taking more and more care of them. My sister, who lives in the same town, started working one day less a week so she could spend more time with them and taking care of their needs. Each of my two brothers and I visited for the best part of a week every five or six weeks; a huge disruption in our own lives, but one that was willingly made as we realised they might only be around for another couple of years or so. 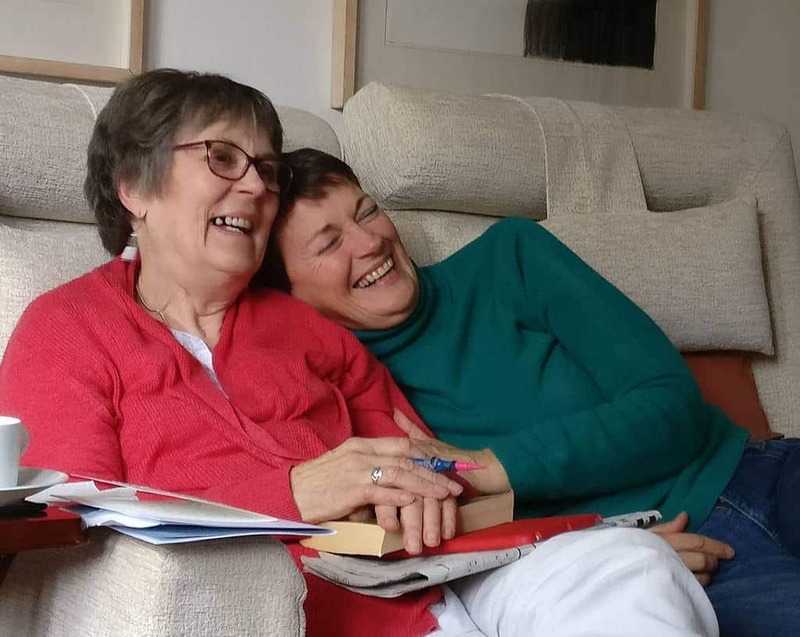 (NB – end of life care affects everyone in the family, not just the person who needs it, and as no-one knows when they are going to die, everyone gets to live with the challenge of uncertainty, not knowing, and living in the moment. After all, you can only say it was the last year, the last week, or the last breath when it has already happened). On the morning of 25th September, I got a call to say my Dad had died in his sleep. What a peaceful way to go. I was speaking that night in Edinburgh, at the graduation of the School of SSE Social Entrepreneurs Programme that I had been a participant in for the last year, and decided to go ahead with that anyway; Mum wanted that and we agreed Dad would have wanted it too. I used my powers of focusing and decided to give a great speech, that he would be proud of. It worked! After that we drove on down to York in England to be with my Mum. I chose not to see my Dad’s body; tuning into myself, that felt fine. 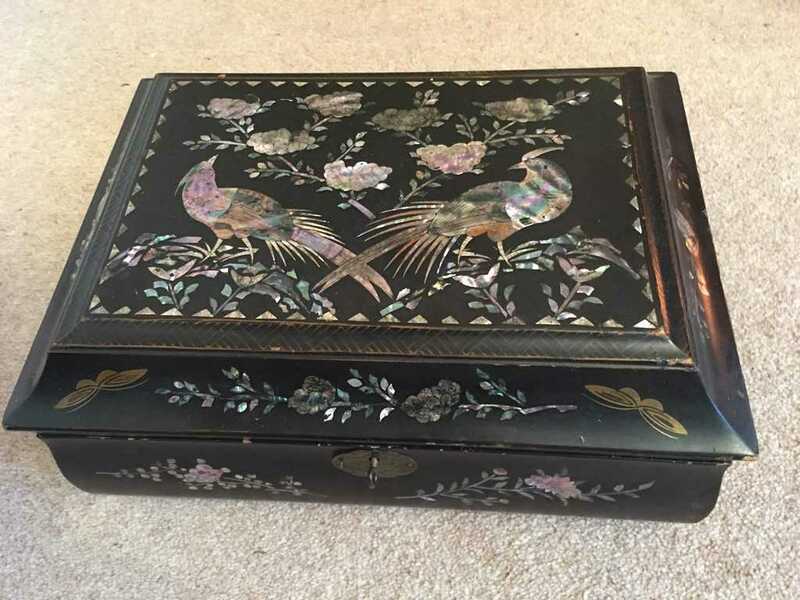 Both my parents had a will, where I and my sister were the executors, and they had completed their Before I Go Workbook , so all the information was at our fingertips, as we helped our Mum with the registering of the death and the organisation of the funeral. I’ve been banging on for ages about how good it is to be able to carry out someone’s wishes (based on the bits of information my husband had told me before he died in 2011), but now I was really getting a much bigger experience of it. 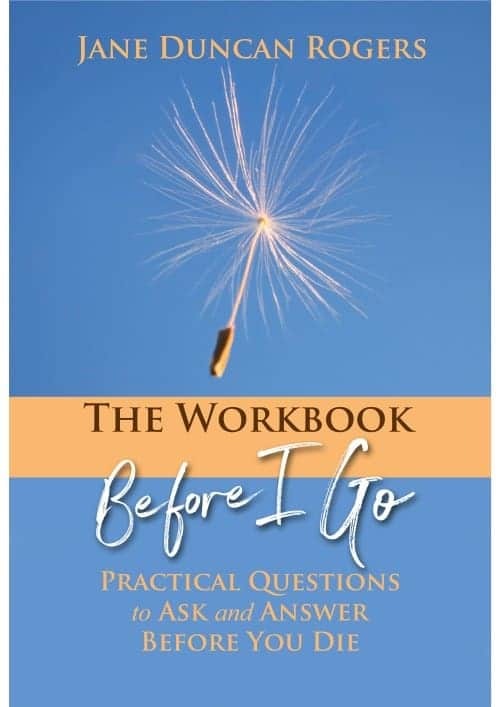 Even just being able to look in one document (the Workbook) for various personal information like social security numbers, driving licence details, bank accounts etc made life a lot easier, and continues to do so as I organise the application for a grant of probate. We arranged a date for the funeral, fairly far off to allow those from far away to attend, and then planned to drive back home to the North of Scotland (9 hours away). The previous night, my Mum had suggested she stayed alone overnight in the house, to experience what it was like to be there on her own without my Dad. We had agreed, and my sister rang her that morning to find out how it had been. No answer. We met my sister at the house to find that my Mum too had died in her sleep. This time I did see the body – and she looked just like she did when she was having a nap in the day. I felt so tearful and shocked, and yet relieved that she was no longer alone without Dad, and wouldn’t have to go through any of the further ravages of MND to her system. Talk about a maelstrom of emotions though; I was reminded of apparently being able to feel sad and glad all at the same time, not to mention relief, mild guilt for feeling relief, and just sheer pain and sorrow as we took on the task of speaking to my parents’ friends all over again, having just a few days earlier helped my Mum ring round and tell them all about Dad. That was the worst part of it all. 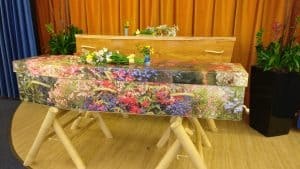 Then questions – was it possible to have a joint funeral? Could the coffins both be in the same hearse? 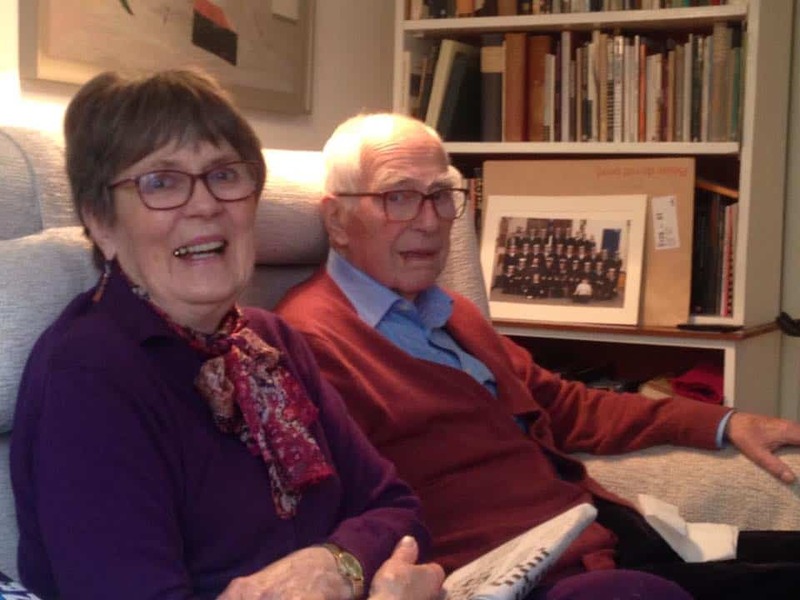 Could they be together still in death, as they had been in the 67 years since they met at Edinburgh College of Art? How to phrase a double death notice for the newspapers they had requested be notified? Who was going to register this second death? (Fortunately, one of my brothers did that, as neither my sister nor I could bear the thought of seeing the same registrar again so soon). And anyway, how had my Mum died, what had happened? There didn’t need to be a post-mortem as the doctor had seen her so recently, and she stated she had died from MND. True, she had had trouble with her lungs, and sometimes apparently these can deteriorate very quickly. But perhaps she died of a broken heart. Who knows? (Although I personally am sure that was a factor in it). We managed to get everything sorted for a joint funeral on 12th October, made so much easier by simply carrying out their instructions. 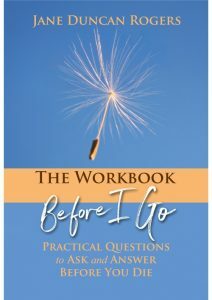 What I hadn’t fully realised was that not only was the process made easier, but my goodness – the solace, comfort and relief I (and all my siblings) felt at knowing we were doing what they wanted – and knowing that they had known we would do that – was indescribable. Plus there were no arguments at all. It just made all the difference, almost like they were still there somehow, and strangely enough, even in attendance at the funeral tea afterwards. They had been to the location, had actively chosen it, my Mum had chosen the funeral tea menu and the result was we had a really lovely party, of the kind they would have adored. That felt so good! Then the next day, I cried. Oh, how I cried. Tears, tears and more of them – they just kept on coming and uncomfortable as it was, it felt good too. 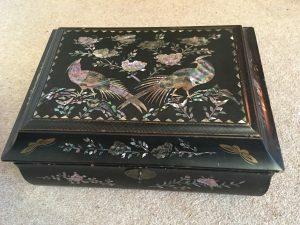 (Although when I discovered my Mum’s jewellery box and realised I had forgotten to ask her where it had come from, that just felt terribly painful – and affirmed how important it is to create your Living Legacy in advance). There’s lots more I could say about all this – and I’m sure it will come out in various blog posts over the year. I feel hugely grateful to my parents, whose legacy lives on not only in the art world in N. Ireland, on which they had made such a positive impact, but also in the work of Before I Go Solutions. 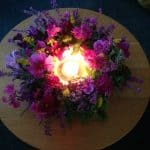 They have now become great examples of people who took the time to talk about their wishes, and to write them down; who did their ‘death cleaning’ – letting go of things they recognised were not needed any more; and who loved us enough to recognise the importance of all this, and willingly (and even cheerfully) were able to do so. They gave us all an example of a good end of life. I want to write… but I dare not. How can mere words express….? I am astonished. I am deeply grateful that you have shared your ……experience. It’s no cliché, that’s for sure. What a wonderful example you and your parents and siblings are to how important it is to prepare. You and your sister and brother are heroes Jane and your story very poignant. Thank you for sharing this story with us, and I dare say that yes there will be a lot of blogs and sharing your experiences in future. There is nothing better than the example of one who knows. One who has been there and knows what it’s like to have the pleasure,of carrying out your loved ones wishes. Thanks Trish; not sure about the heroes bit! We just do what we need to do when it is needed – just like yourself. Thank you Jane for finding the words to tell the story of your parents last weeks and their passing. I appreciate the generosity and serenity of this act. This act feels like a act of kindness and compassion, encouragement for others who may experience similar situations. Lovely. Through your sharing, we can also reciprocate to you with compassion and love. Through your sharing something grows in all our hearts and souls. With gratitude. Thank you Sharon, that is lovely. It feels quite amazing that now my parents are still giving to the world in the way they died, just like what happened with my husband. How beautifully you tell this poignant story, Jane. I am reading Ram Dass and Mirabai Bush’s book, ‘Walking each other home’, and in it Ram Dass says something about linked souls dying close together. Your parents sound amazing, and very special. Much love to you as you grieve this double passing. Thank you Jane for sharing your most personal lovely story of your parents. Im sitting here thinking what can I say after reading the lovely reply’s above, then I remember after losing my Dad late last year it doesn’t matter what people say it’s just the acknowledgement that they cared enough to send a card or stop me in the street that matter. “Your life will never be normal again but you will find a New kind of normal”.